With the expansive 102° field of view, Retractable Earbuds, Touch Screen/Action Button(Shooting games) and ultra-comfort padding, the VR brings you the best VR experience powered by your smartphone. 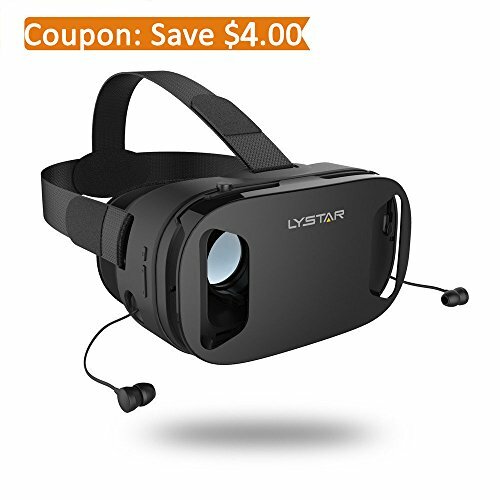 Works with over 500+ iOS/Android virtual reality apps. This VR can't automatically transform images to 3D format, you need to search and download virtual reality APPs with 3D format video or watch panorama videos on YouTube, Apple Store or Google Play. 4. Adjust the lenses to suit your pupils,make sure the screen is clear and you feel comfortable. [Keeping Your Phone Safe] -- 45° half-open mobile phone anti-break cover design; Specially design of front cover on VR headset has 2 holes in order to be fast heat dissipation of your smartphone and it also can take photo directly. Both sides holes is specially designed for the headset / data / charge cable.